Travel For Soul: Trip to Milan. A Mileu. Milan was the last of the Italian cities in our trip, as also the city we were flying out from Italy. 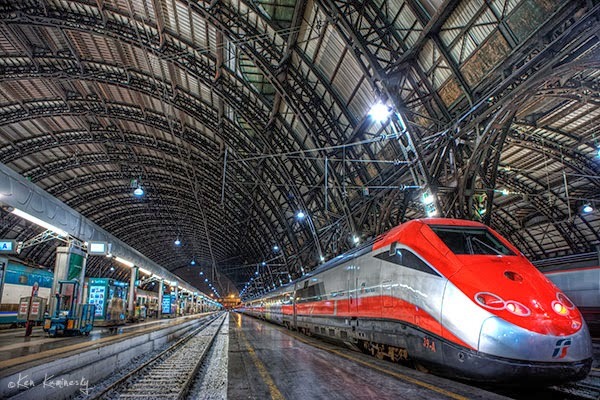 There was an early morning train from Venice to reach Milan. The timing of our train was awkwardly early being 5 in the morning. Not sure about Vaporetti services, we had to rely on our feet. The morning Venice was as calm, as we had left it in the night. Odd students crossed our way, as also some enthusiast morning walkers. It was quite cold and with our hustle and bustle, we reached our station well...earlier than we thought we would. There weren't many travelers for that time of the day. An interesting story took place, that day on the station(I'll post that later). We almost lost our train. Thankfully, to be in Milan, we boarded. Then some snores ahead we reached a rather bitterly cold Milan. Cold winds blazed ferociously across the channel of walls on the 'Milano Centrale' station. The chill took us by surprise without an exaggeration. thankfully, it didn't snow as we were expecting so through news in Venice. We kept our bags at 'Luggage room' situated on the station. This gave us some time to be at the Historical Center. Milan is as cosmopolitan as fashionable. Italians prefer to associate it of being more European too than Italian. Milan is a major financial center in Europe. The morning office goers bustle was quite different from its Italian siblings(cities). Swanky cars and an array of traffic lights dotted Milan everywhere. High rise skyscrapers and meticulously executed town planning gives Milan a distinct flavor of its own. And yes, how can we forget the traditional historical center of an Italian city. Men and women alike, all are dressed elegantly and perfectly.None is in 'out' of fashion. Also, evidently, it's very much a global city. English is widely spoken in Milan. After roaming around for a bit, we caught a bus to the Malpensa airport. The expressway joining the city was excellent, with tempting 'Geneva' posts overhead. It wasn't congested but it may get so sometimes. So it's safer to keep that additional margin of time. 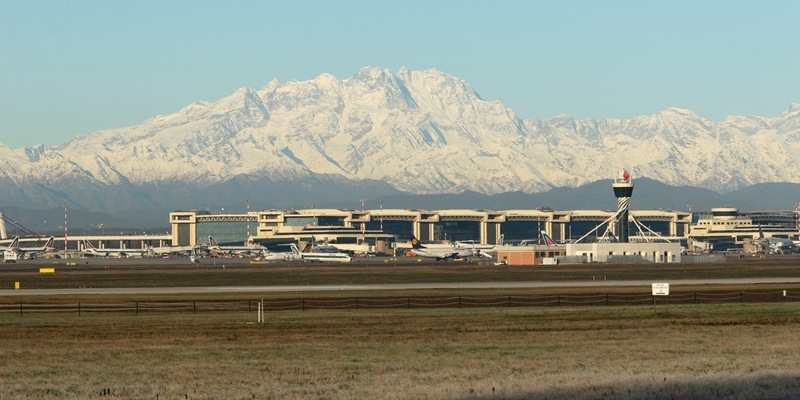 Malpensa airport is quite picturesque with beautiful snow capped mountains in the background. I just so wish, that had we got an additional day, we would have had sufficient time to explore the city. Alas, (for consolation in this case), there is always a next time. If going only for travel, a day and a half would be ideal for Milan. We caught our return flight via Cairo to reach back Mumbai. Phewww, Italy was some trip!!! Stayed : In Milan for 1/2 a day . Stayed at : Didn't have to stay in a hotel. Traveled in TrenItallia from Venice in January 2013. You've been to Milan? Do you want to travel to Milan? Feedback for my post(s) ? Look forward to your comments ! Thanks for taking me to Milan. I loved that mountain range. Is that the Alps or Apennines? Thanks Umashankar Ji. That's Apennines in the backdrop. Keep dropping in by to my blog.